Lahanodolmades is a Greek dish of stuffed cabbage leaves filled with meat and rice and served with an avgolemono sauce. The meat and rice stuffing is flavoured with oregano and mint. The avgolemono sauce adds a lemony kick and takes away any thought that cabbage is a fundamental part of this recipe. This may not be the most attractive dish but what it lacks in appearance it makes up in flavour and has to be the ultimate in comfort food. My mother only made this for my brothers and me, never for anyone else. I don’t think she ever thought it was showy enough. Perhaps that is why she always accompanied it with chips! I have eaten it many times when I have cooked it myself without the chips but for me the chips are the icing on the cake. My ritual is to eat the Lahanodolmades and then use the chips to mop up the avgolemono sauce. Heaven. Well, for me that is. Many Greek recipes call for Arborio rice, in this recipe it has been replaced by long grain as per my mother’s recipe. No doubt she used this when she moved to England because she would have found it difficult if not impossible to find Arborio and like a lot of her Greek recipes she had to improvise. Even though as the years passed and Arborio has become available my mother stuck with her long grain improvisation. It took me a long time to make Lahanodolmades for myself, I just didn’t have a need. When I was at home I would watch my mother on numerous occasions make this whilst sat on the kitchen chair chatting about nothing, never thinking to note anything down. When I left home I was busy trying all the things I didn’t get to eat at home to worry about any recipes. It wasn’t until quite a few years later that I began to hanker after my childhood food. I think my mother knew that she had a slight power over us. If we visited her she would make our favourite foods. It was a way of luring us in. When we did visit it turned into a game, what dish my mother served up indicated who was the favourite. If we planned a visit to my mother’s she would always ask what we would like her to cook for us. My reply was either Lahanodolmades or Paella. When I sat down to eat it usually wasn’t either. There would always be a long list of rotating excuses why not, usually because they were a lot of work. This all stopped when I realised what went on when my elder brother visited, he too requested my mother’s Lahanodolmades and that’s exactly what he got. I can remember turning up unexpectedly one evening to find him happily eating a huge plate of them with the accompanying chips. When I exclaimed my outrage my brother sat and laughed and said in a very smug way that if I wanted to eat them in future I should check when he was visiting! This recipe sounds complicated but it isn’t and neither does it have a long list of ingredients. The ratio of rice to mince is up to you. As with a lot of recipes the meat can be padded out with more rice. I use oregano and mint but these can be replaced with parsley and dill, it’s just a matter of what you have in the cupboard or garden at the time. Another joy of this recipe is that it can be made the day before and reheated gently so as not to break the Lahanodolmades. The avgolemono sauce does though need to be made fresh just before serving and cannot be reheated. Take the whole white cabbage turn it over and cut out the heart. Place a large fork or as you can see I have used a serving fork into the middle of the cabbage. Put a large pan of salted water onto boil. The pan needs to be big enough to incorporate the whole cabbage. Place the cabbage into the water when boiling and leave it in for a few minutes. Remove. Gently pull away the outer leaves as they loosen. Place the whole cabbage back into the pan and repeat until all the leaves are removed. Set aside the leaves until they are cool enough to handle. Any of the small leaves or pieces of cabbage not used can be placed in the bottom of the pan. This will act as a vegetable trivet and will stop the Lahanodolmades from burning or catching whilst cooking. In a pan put the tablespoon of oil and heat gently. Add the onions and cook until transparent. Remove and cool. Put into a bowl the mince, washed rice, onion, herbs, egg, salt and pepper. Mix well with your hands. Take one cabbage leaf and with a sharp knife cut any large tough veins out. Place a walnut sized piece of mince and rice mixture into the middle. Bring up the sides and roll. Place the rolled cabbage parcel on top of the cabbage lined pan and start to fill the pan up creating layers of parcels. The aim is to pack them in tightly. When all the leaves have been wrapped and packed into the pan place an upturned saucer on top to anchor them down. Dissolve a stock cube in some boiling water in a jug and gently pour this into the pan until it just covers the Lahanodolmades. Put a lid on the pan and gently bring to the boil after which turn down to a slow simmer. Leave them to simmer for about 60 to 80 minutes. Beat the egg yolks to a creamy constituency in a pan. Now gently add a cup of stock from the pan of cooked Lahanodolmades which has been allowed to cool until tepid and stir well. If you add the stock too hot it will curdle the eggs. Place the pan on a low heat and stir until the sauce thickens. Do not over cook. Depending on how thick you like your sauce you can either add more or less stock. As I usually make enough for two meals I do not add the sauce to the pan of Lahanodolmades. I serve them onto a plate and pour the Avgolomeno sauce over them. Serve as they are with the sauce and if you wish a large helping of chips! Youvarlakia is a Greek soup dish made of lamb and rice balls in an egg and lemon broth. This is one of my favourites. For me, it is true comfort food. Not the most attractive of dishes but as they say, never judge a book by its cover. What it lacks in plate appeal it certainly makes up for in taste. The avgolemono broth has a combination of lemon which gives it an acidity with the eggs softening this by creating a creamy richness. These go together beautifully with the lamb and rice meatballs. Many Greeks add potatoes and carrots to cook with the broth, but I prefer mine plain or with some wilted spinach. I can still see my mother at the kitchen table pushing meat and onion through the mincer clamped to the table. The minced ingredients would then be placed into a large mixing bowl where she would knead them with her hands for all she was worth. I am sure looking back that this was a way to get out all her frustrations – and early form of de-stressing. I now realise that I spent an awful lot of time sitting at the kitchen table watching her cook, learning to judge when to interject with offers of help and when to just keep quiet. When it came to the task of mincing, I was always desperate to turn the handle, but the occasions that I was honored with this task were few and far between. When my chance came my fear that if I turned the handle too quickly there might be a nasty accident meant that the turning was painfully slow. After a couple of minutes my mothers patience ran out and I was relieved of the task for being too slow and sent back to my perch on the kitchen stool! When I make this dish I am reminded so strongly of my brother. We knew those little meatballs as hedgehogs because of the spikes of rice that stick out of them. We both loved them and would always ask my mother to cook them. Later in life when we returned home for visits there was always the prior discussions with my mother on what we wanted her to cook for us. Youvarlakia and Lahanodolmades (the same meat mixture but wrapped in cabbage leaves) were the two favourites that I remembered asking for – the usual reply back was that they were a lot of work but instead she would cook me something else much nicer. Except, that was, when I went home and my brother was there. Then we would get Youvarlakia or Lahanodolmades. They were his favourite and obviously the importance of pleasing the eldest son was a very big factor for my mother. When I complained at the table that she never made these for just me, my brother would laugh resting his hand on my arm to demonstrate he meant no malice but silently saying ‘well what do you expect’. I soon made sure that any future visits coincided with his! Some recipes call for a little oil or an egg to be added to the meatball ingredients, supposedly to lighten them and perhaps bind the mixture. I find this makes the broth a little greasy and I feel do not add to the dish. Mix together the meat, onion, rice, mint, parsley and season with the salt and pepper. I find that it’s best to use your hands. Knead until very well combined. Now take a slightly larger tablespoon of the mixture and roll into a ball. Roll in the flour to coat. Put the stock in a pan and bring to a gentle boil. Gently drop the floured balls into the stock, cover and lower the heat. The liquid should just cover all the balls. Gently simmer for 45 minutes. Remove from the heat and pour a little of the stock into a cup. This will be used for the sauce. Separate the eggs. Whip the egg whites with a little salt until soft peaks are reached. Continue whipping while adding the yolks, continue to whip, add the lemon juice and then the saved cup of the now cooled stock a little at a time – the stock needs to have cooled and added a little at a time as you don’t want to curdle the eggs. I tend to add a little more stock from the pan to the egg and lemon mixture before adding this to the pan with the meatballs. Once added give the pan a good shake to incorporate the avgolemono broth. You could use a wooden spoon to mix but the meatballs are prone to breaking. 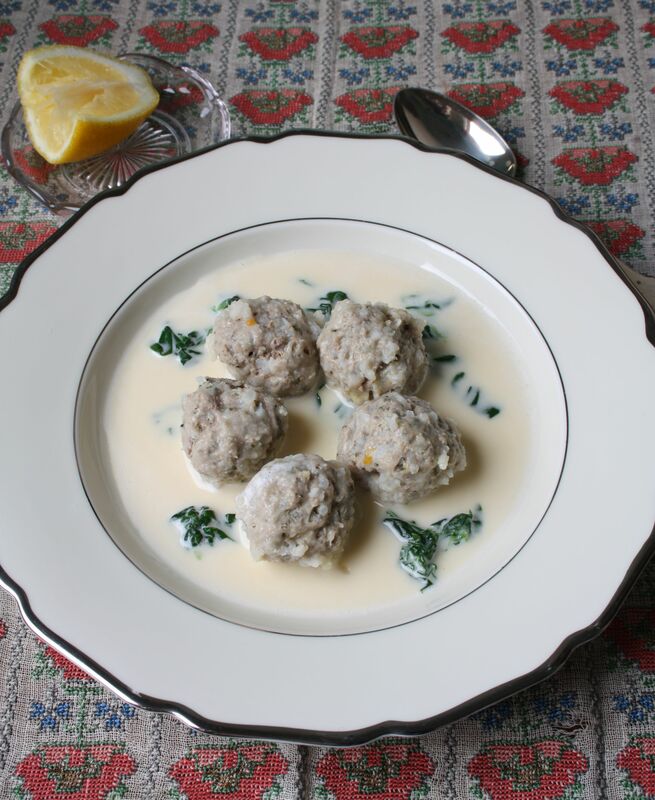 Place the balls into a soup dish and spoon over the broth, serving with some extra lemon. The downside of the avgolemono broth is once made it doesn’t like to be reheated. The way to get round this is to make the meatballs and remove them from the stock. The meatballs can be refrigerated separately. If you are planning on making the meatballs last two meals then it is best to reheat half the meatballs with half the stock, making fresh avgolemono broth each time.